The Canterville Ghost is set in the beautiful English countryside near an old town, Ascot, which is famous for its horse racing. Here, in Canterville Chase, a beautiful old country house, lives a 300-year-old ghost from an old English family. The ghost is famous in the area and has frightened many people for years. He is proud of being a very scary ghost. However, things soon change when an American family comes to live in his house, and problems arise for the ghost right from the start. The previous owner of Canterville Chase, Lord Canterville, warns the Otis family that an old ghost lives there, but they are not worried, as they don't believe in ghosts. The Canterville ghost tries to frighten the family. However, they are not afraid at all. The young twin boys in the family play tricks on him and laugh at him. Mr and Mrs Otis even try to help the ghost. They give him oil for his noisy chains and medicine for his ghostly voice. The ghost is very upset and depressed and he tries to think of other ways to scare them, but everything he tries fails. 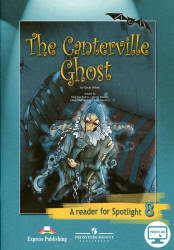 The Canterville ghost is very sad but then one member of the Otis family helps him in a way he never imagined.